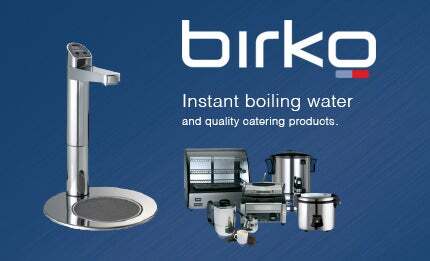 Birko is an Australian manufacturer of industrial and catering-standard boiling water and commercial equipment. The company, which has over 50 years of experience developing products to heat food and beverages, provides catering equipment for many industries, including the mining industry. Birko is committed to providing high-quality equipment at a realistic price, and provides a 12-month warranty as standard with all products. Our beverage range includes the Birko TwinTemp, which provides instant boiling and chilled filtered water, Filter Tap and the Food and Drink Heater, an updated version of our first product that provides a portable solution to heated meals. If you need a portable solution to providing hot drinks for your staff, our commercial urns are ideal. These electric urns are Australian made and come with handles and a lockable lid to ensure safe transportation. With four sizes available, from 10l to 40l, we have an urn to suit every company. Alternatively, our Birko Tempo Tronic over-sink product supplies boiling water instantly when needed. Available in sizes from 1.5l to 20l, this is the ideal addition to any company kitchen. It also comes with a technically advanced filter system to provide healthy, filtered boiling water. For companies where coffee is popular, our 20l coffee percolator is perfect. Add cold water and fresh coffee grounds and the percolator does the rest, producing up to 100 cups. Birko’s food heating range covers everything from soup kettles to microwaves, and we sell equipment for both large and small operations. Large mine sites with onsite accommodation will need catering equipment to feed their entire staff, and we offer numerous products to aid this. Cooked breakfasts can be prepared for large numbers of staff with our range of fryers and griddles. Our conveyor toaster, which has an output of 600 slices an hour, will ensure no one misses out on their morning toast. High volumes of food can be quickly prepared with our food steamer oven, and full meals can be served to your staff with our Bain Marie. Our pie warmers are another great way to ensure food stays hot in a canteen environment. Smaller operations will benefit from our rice and steam cookers, microwaves and six-slice toasters, all of which are designed with value and performance in mind. Birko also produces a range of insect killers, an essential product in areas where mosquitoes and other insects are common. These are commercial-quality products designed to be sturdy and durable while aesthetically pleasing. Our glueboard flykillers have been developed with maintenance in mind, and are easy to clean. If you would like to know more about our range of products, or to discuss any site-specific requirements, please contact us using the details below. We are represented in New Zealand by Zenith Industries. The brilliant new Zip HydroTap G4 is not only the world's most advanced filtered drinking water appliance, but it also comes in a range of designer finishes to suit any style of interior design. Birko's griddle toaster is a robust, non-slip machine for reliable commercial catering. The machine can be easily switched between griddle and toasting functions and has thermal overload protection. Zip HydroTap G4. The brilliant new generation of the world’s most advanced drinking water appliance has been launched.